This brisket is classically prepared, with onion, carrots, celery, red wine, and fresh herbs, and braised until tender. It’s simple to prepare and cooks low and slow in the oven! It’s finally starting to cool off around here! I’m pretty sure yesterday was the first time I didn’t have to use my air conditioning since last May, and keep in mind, I set the thermostat to 80 degrees F (meanwhile my brother is texting me from Manhattan telling me that it’s snowing). I celebrated the milder 70 degree weather by making something that required the oven to stay on for two hours! 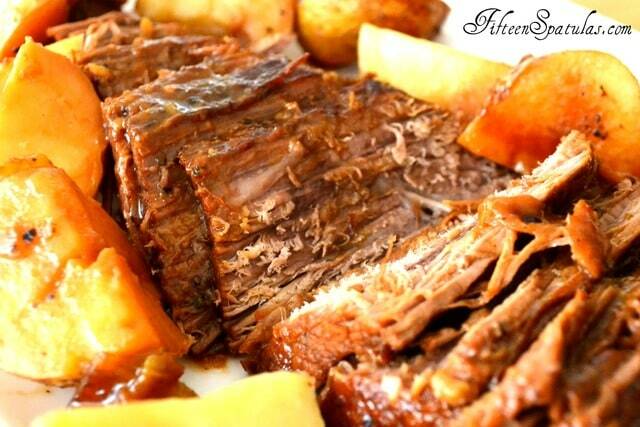 Braised brisket is one of my favorite fall/winter dishes, it’s just so tender and flavorful. Tough pieces of meat like brisket may take a lot of time and care, but they also reward you with some of the best flavor out there. You will notice this recipe is very simple, but don’t underestimate the deliciousness. You’ll eat this right up. 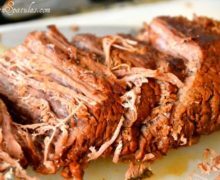 This brisket is classically prepared, with onion, carrots, celery, red wine, and fresh herbs, and braised until tender. 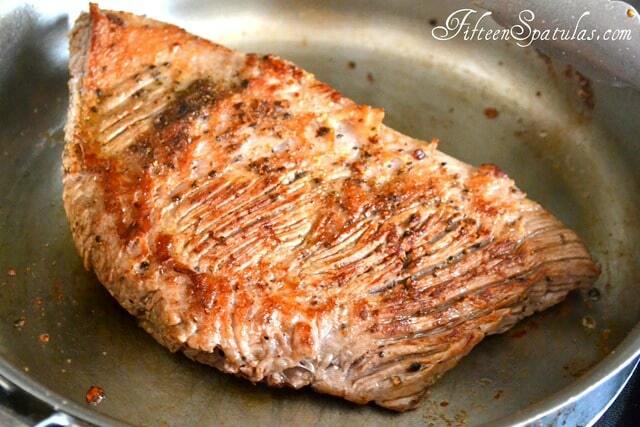 It's simple to prepare and cooks low and slow in the oven! Heat up an ovenproof skillet over medium high heat, and add the olive oil. Season the brisket all over with salt and pepper, then sear the meat in the pan, until brown on all sides. Take the brisket out, and add the onion, carrots, celery, and radishes to the pan. Turn the heat down to medium and saute for 5 minutes to brown slightly. Deglaze the pan by adding the beef stock and red wine, and scrape up all the brown bits from the bottom of the pan. Add the bay leaf and thyme, and add the brisket back to the pot. Bring the liquid to a boil, cover with a lid, then pop it into the oven for an hour. After an hour, check on the tenderness of the brisket. It will likely need another hour. Flip it over and let it continue to cook. 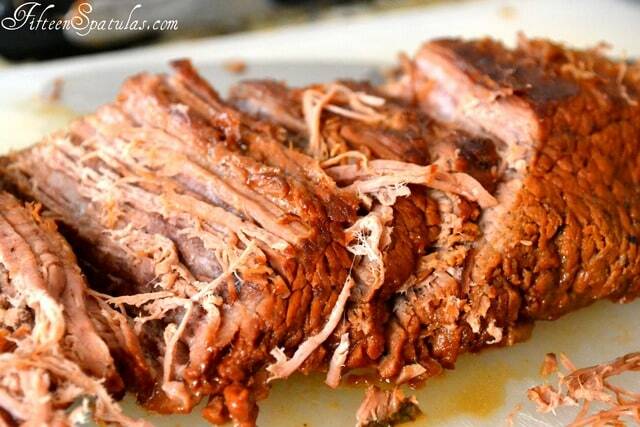 To serve, remove the brisket from the pot and let rest for 10 minutes before slicing. If you wish to turn your braising liquid into a sauce, put the pot back onto the stove and reduce it down to the desired consistency over high heat. Use a fine strainer to strain out all the vegetable chunks, and serve with the brisket. Enjoy! We Irish-Texans think there’s only two ways to cook and eat brisket: corned beef and smoked. I was looking for something different and read your recipe. I’m glad I did. I haven’t figured out what made it smell and taste so good (the vegetables and thyme in the cooker? ), but it is great. My wife made the recipe and followed it up to the end of step 4, where she put it in a slow cooker on low for 8 hours. The meat was super tender and moist through out. We really enjoyed it. Now we have three ways to enjoy brisket. Hi Craig, Irish-Texans, I love that! That’s so great your wife thought to finish the brisket in the slow cooker. Brilliant! I’m going to try that too. I’m so glad you all enjoyed the brisket!